This is a new old stock in open box vintage Hitachi VK-C1600 auto focus MOS color video camera. The camera is in pristine condition with minimal to no scratching. It has no damage or broken parts. The camera comes with a cable as seen. The box is in great condition with minor wear. Comes with the styrofoam too. Item turns on with no issue using the power adapter. PO BOX number. Will show wear and tear. TOP PORTION OF THE CASE NEEDS REPAIR. Hitachi HQ VHS Video Camcorder VM-5200A Complete W Hard Case Excellent Condition. Shipped with USPS Priority Mail. Hitachi DZ-HS300A Video Camera/Recorder "NEW IN BOX" "NO RESERVE" "UNOPENED"
It still has the factory Hitachi seal. This will be sold for parts or repair. Everything is in near flawless condition, see photos. MAUFACTURED IN JAPAN, THIS TOP OF THE LINE HQ VHS HITACHI CAMCORDER IS LOADED WITH FEATURES TO EASILY RECORD AND PLAYBACK CRISP, CLEAR VIDEOS LIKE A PROFESSIONAL. 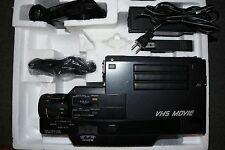 YOU CAN ALSO TRANSFER OTHER VHS VIDEOS TO YOUR COMPUTERS HARD DRIVE AND COPY TO A DVD, AS LONG AS YOU HAVE THE PROGRAM & GRAPHICS CARD TO DO SO. Hitachi VHS Camcorder VM-2300A. Shipped with USPS Priority Mail. Hitachi Cam N Cord VM 2100A - VHS. Shipped with USPS Priority Mail. POWER AC117V 60Hz 6.2W. HITACHI DENSHI, LTD. MODEL KP-C100U. Be sure to check out the provided photos. EXCELLENT CONDITION! Viewfinder appears to work properly. 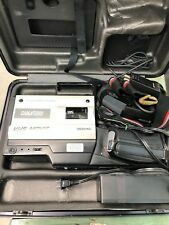 Hitachi HQ VHS Video Camcorder VM-5200A in Hard Case - Works plays tapes and records, other functions tested as well and work. Item is being sold as is not working for repairs / restoration or display purposes. Hitachi HQ VHS Video Camcorder VM-5200A. This would connect to another source to record. Vintage Hitachi Cam-N-Cord Video Camcorder Camera Recorder VM-5000A VHS ...READ! 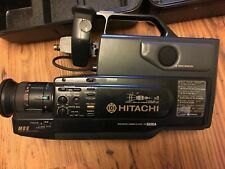 Hitachi cam n cord VHS movie camera recorder Being sold in as is untested condition!! Intact with no cracks or breaks. The foam around the microphone has disintegrated. The power cord is not present so I can’t test it. Hitachi VM-5000A VHS Movie Camera/Recorder in Travel Case - Untested. Sold AS-IS. Camera itself looks clean, but camera and components could use a good cleaning. Case has a lot of wear to foam padding and exterior has some scratches and the hinge on bottom has surface rust. However, the case functions as is should. This camera unit has not been tested and being sold as-is! Please view all pictures for better details. Complete set in original box including battery. HITACHI VM 3150a COLOR VIDEO CAMERA VHS VCR WITH CASE Sold AS IS. turn on but it does not work, the cassette is stuck the door does not open, it rings to open but does not open, come with manual, charger good, 2 battery (no charger, no work), movie VHS, Case. Need new battery. Has scratches and wear, Sold for repair or part, No return. Maybe no working(For parts or not working). Not tested but still in good condition. Up for Sale are 2 Hitachi VK-360 Color Video Cameras with Chinon CL600 Auto Focus and a Manfrotto bogey #3009 Tripod! They are for Parts! Sale As-Is! The units are in good cosmetic condition! If you have any questions feel free to message me!